The world-building going on in the Aldi Christmas ad cinematic universe is fast becoming untouchable. It was an ad that ended on a rather worrisome cliff-hanger, after Kevin's reckless driving left his truck hanging off a cliff, crying for help — and it seems that, in the meantime, Kevin's troubles have only worsened. First of all, the narrator confirms that this latest ad takes place "in times Medieval" — meaning that Kevin has existed for at least 500 years. He was driving a truck in the most recent one, so we've got to assume that this one is a flashback. 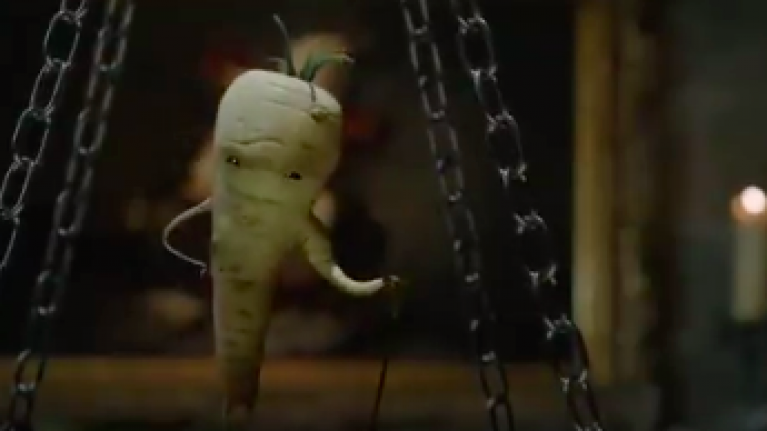 This time around, a character called Pascal the Parsnip, an apparently cannibalistic parsnip who speaks with an Eastern European accent, has held Kevin's family's hostage, and plans to eat them for dinner. Fortunately, Kevin is able to get himself and his family out of it, seemingly breaking Pascal's legs in the process — which was totally deserved. Additional note: after Pascal falls, Kevin says "Right in the nuts!" Implying that, in this universe, parsnips have testicles. So there's something to think about. Merry Christmas, it's 8 November.